What you are looking at, in the above picture, is the best thing I can imagine eating right now. Mario Batali once said on one of his shows that the best time to eat corn and tomatoes isn’t August, it’s September. My trips, recently, to the farmer’s market confirm this: the tomatoes couldn’t look plumper or more colorful. 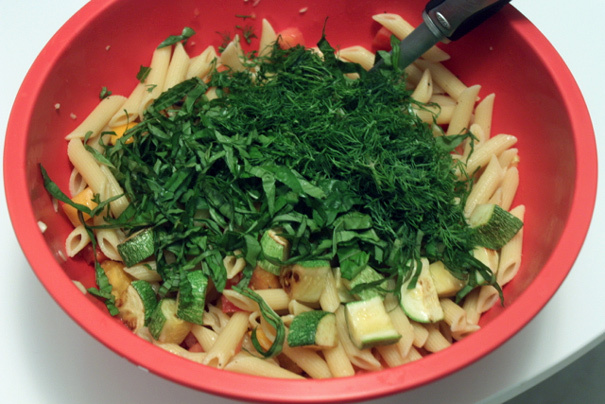 And so it was, last week, that I bought a few red ones, a few yellow heirlooms, some zucchini and a bunch of herbs–basil and dill–and came home to make a pasta dinner that had my eyes rolling back in my head, it was so terrific: an edible “last hurrah” for summer. The process really couldn’t be simpler: no recipe required. 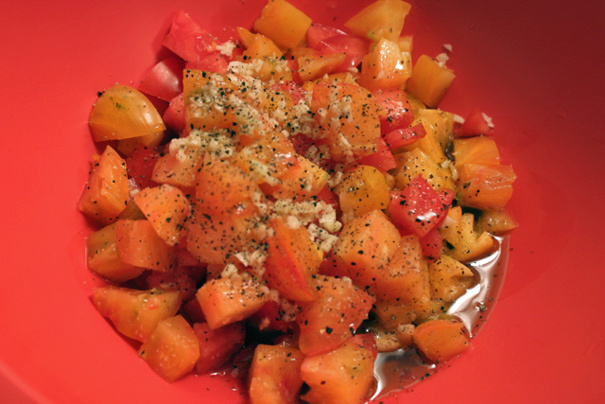 Cut up 4 or 5 tomatoes–the juicier the better–into cubes. Add them to a bowl with 3 minced cloves of garlic, a big glug of olive oil, a splash of red wine vinegar, salt and pepper. Stir all around and taste. It should taste pretty rad. Cook your pasta–I recommend penne (a 1 pound box)–in salted water until al dente, then lift with a spider into the bowl with the tomatoes. Stir all around. 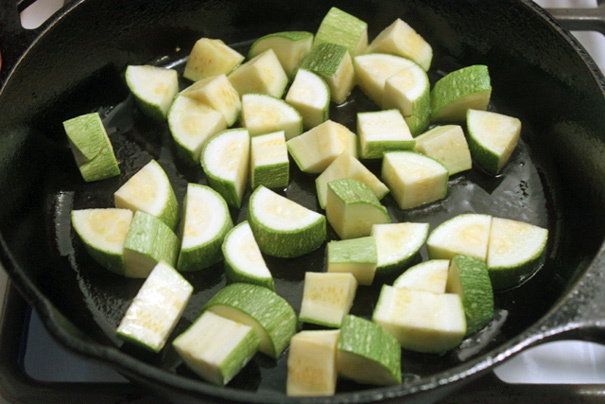 Meanwhile: heat up a cast iron skillet and cube a zucchini. 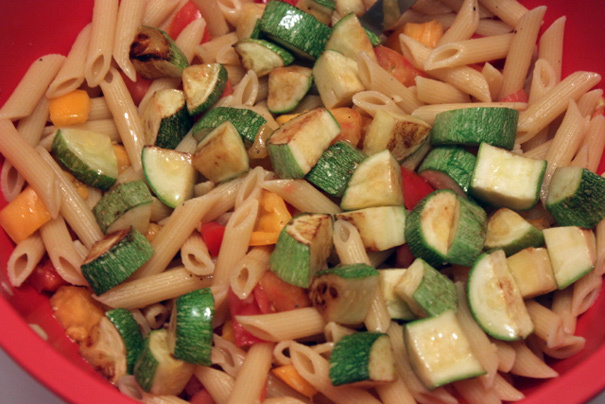 When the skillet’s good and hot, add the zucchini in a flat layer and sprinkle slightly with salt. Let cook (this is indoor grilling, really) undisturbed for a minute, then turn the pieces over to brown on the other side. (If your skillet is well-seasoned, you don’t need to use any fat). 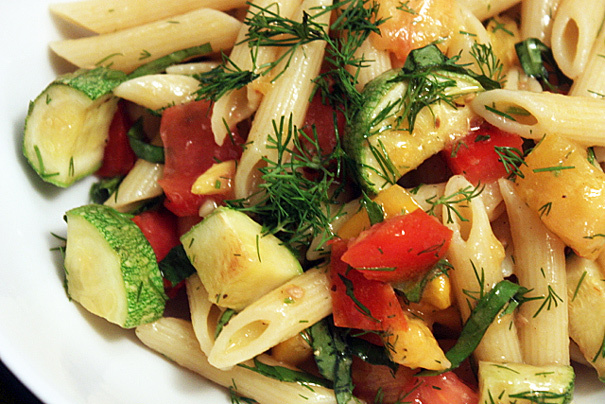 Add the “grilled” zucchini to the pasta and stir. The dreamiest bowl of summer eating I know. I mentioned corn earlier and I did slap myself for not buying an ear or two when I bought everything else; if I had, I would’ve cut it off the cob and grilled it, like the zucchini, in the cast-iron skillet until it got some color. 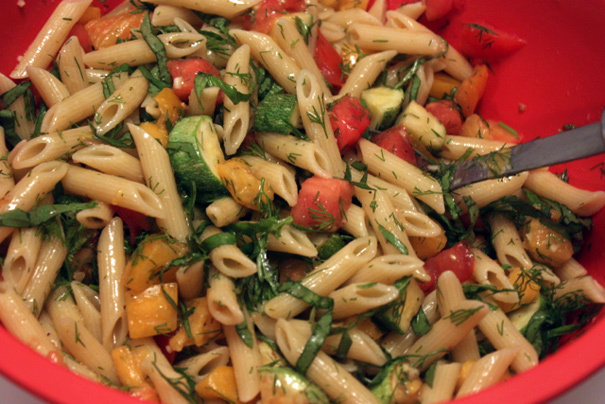 Luckily, there’s still time to do that when I make this again…and oh, yes, I’ll be making this again.